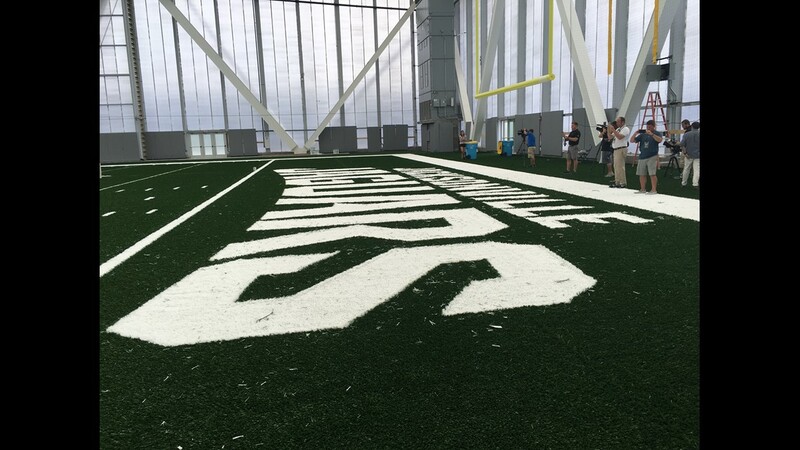 The Jaguars unveiled their new practice facility Friday. 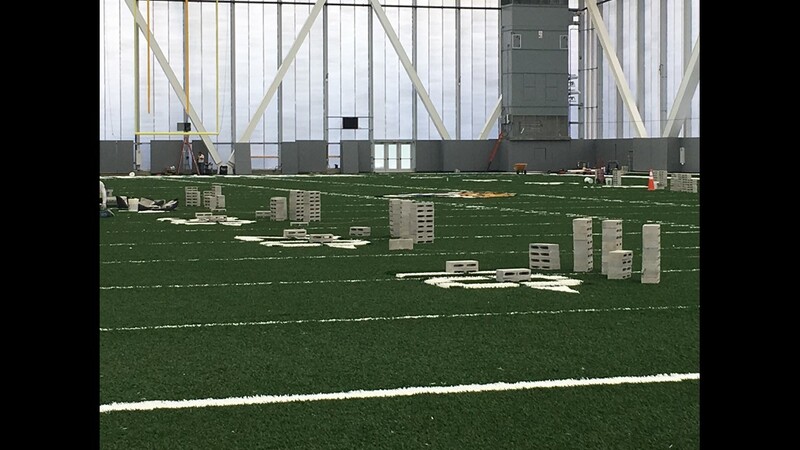 The Jaguars now have a place to practice when rainy weather strikes Jacksonville. 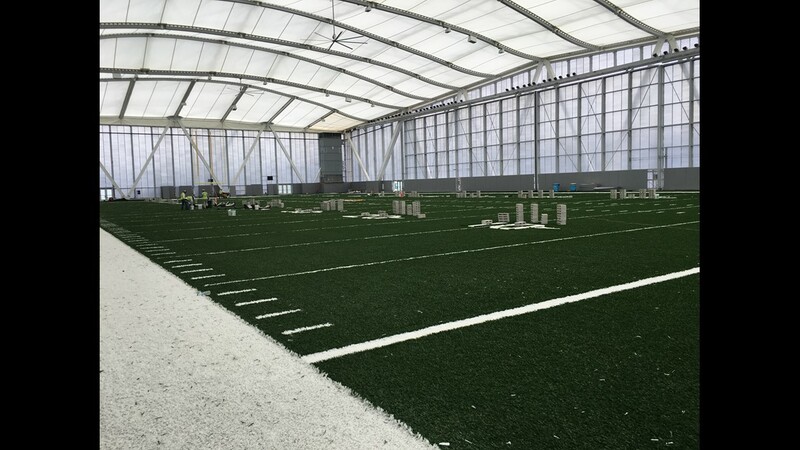 The team unveiled its nearly finished indoor practice facility Friday. The 94,000-square foot structure, which is attached to Daily's Place, is expected to be completed before the Jaguars return from their first preseason game against the New England Patriots Thursday. Jaguars Team President Mark Lamping hosted a tour of the facility and told the media that the team planned on finishing the project sooner, but weather got in the way. "We had hoped to have it done earlier, no question about that," Lamping said. "The idea was to have 100 percent complete by the time the team came back [for training camp]. We had a lot of rain - at one point - there were some areas of the roof that weren't completely water-tight. We had water on the field and we had to wait for it to dry." Crews are currently working on the final touches on the field. Lamping said the field work should be completed by the end of the weekend. "The most important thing is the field itself," Lamping said. "What's happening behind me is the final markings being sown into the turf. When you look at them out there, they're putting in the yard markers is what they are doing. Once that is complete, we expect to done in the next 24 hours. Then the process of dressing the field with the small rubber pellets you're familiar with, with indoor fields." Following the field work, five cameras will be installed to film practices. The facility will be cooled to 75 degrees and Lamping doesn't anticipate it getting much warmer than that. The facility features airline hanger doors, which can be opened for other events, including potential concerts. Still, Lamping said the main focus for the indoor field will be on the team. Lamping said the Jaguars have been using the facility for light practice work and walkthroughs since returning for training camp. He added that the feedback from the players, coaches and front staff has been positive. "The number one customer for this facility is the Jacksonville Jaguars," Lamping said. "It's not the business side of the Jacksonville Jaguars, it's the football side of the Jacksonville Jaguars." Follow Mike Kaye on Twitter at @Mike_E_Kaye.